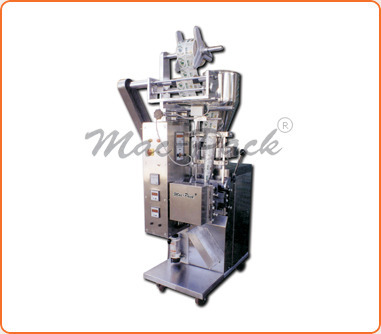 This Form Fill Seal Machine is equipped with mechanical device in that we can pack Granules like Sugar, Tea, Custard, Seerakam, Pepper and all Spices etc. Powders like Coffee, Detergent, Masala, Turmeric, Snuff and all Flours. Maruti Auto Mac Engineers, with more than 18 eventful years in Indian Packing Industry, is one of the leading manufacturers & exporters of Automatic Packing Machine with expertise in filling & sealing machines for powder, liquid, granules, semi liquid etc. We have achieved our leading position with continuous product line expansion in respect to meet the requirements of clients from diverse industries. We offer machine like Bottling Machines, Automatic Packing Machine, Automatic Liquid Packing Machine, Powder Pouch Packing Machine, Sealing & Capping Machine, Mineral Water Pouch Packing Machine, Milk Pouch Packing Machine, Ghee Pouch Packing machine, Pepcee Cola Pouch Packing Machine, Liquid Pouch Packing Machine, Powder Pouch Packing Machine, Granule pouch Packing Machine and Nankeens Pouch Packing Machine. It is our comprehensive customer service and a highly capable team of employees that have backed the organization to maintain its lead. The Automatic Packing Machine and Automatic Liquid Packing Machine are configured with attention to the operator's need. A large extent of parts, components, engines etc., used in our automatic packing machine are manufactured in-house. Every part is assessed to conform dimensional stability and operational features as per industry standard. We maintain a state-of-the-art manufacturing facility on the National Highway No.8, in Ahmedabad, India. Our office in Ahmedabad is well networked with modern communication equipments and worldwide connectivity. Thus, we are accessible by client's at any point of time.